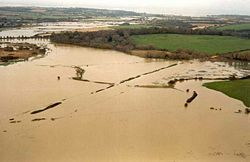 This picture shows the flood plain following a 1 in 10 year flood on the Isle of Wight. 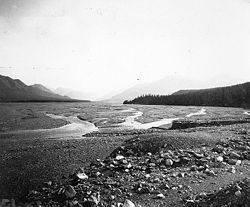 Gravel floodplain of a glacial river near the Snow Mountains in Alaska, 1902. 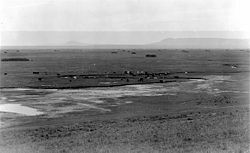 Erosional floodplain with indistinct boundary: The Little Laramie River in Albany County, Wyoming, 1905. 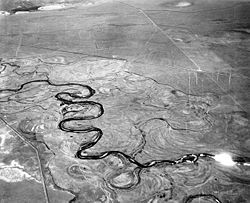 Aggradation and planation: The Laramie River meanders across its floodplain in Albany County, Wyoming, 1949. 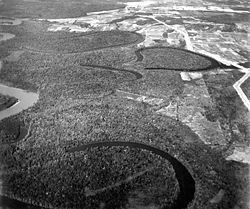 Oxbow lakes on the floodplain of the White River near Des Arc, Arkansas, 1949. Riparian vegetation on the floodplain of the Lynches River near Johnsonville, South Carolina. These tupelo and cypress trees show the high water mark of flooding. A floodplain (or flood plain) is flat or nearly flat land adjacent to a stream or river that experiences occasional or periodic flooding. It includes the floodway, which consists of the stream channel and adjacent areas that carry flood flows, and the flood fringe, which are areas covered by the flood, but which do not experience a strong current. Floodplains constitute a valuable part of the environment. They filter, store, and release floodwaters, recharge aquifers, store a variety of sediments, and provide habitat for a diversity of wildlife. Despite their susceptibility to flooding, floodplains attract settlers who wish to farm the fertile land and take advantage of the proximity to water and river transportation. Unfortunately, in many areas, the development of floodplains has not been planned or managed adequately, resulting in damage to their natural functions. Floodplains generally contain unconsolidated sediments, often extending below the bed of the stream. These are accumulations of sand, gravel, loam, silt, and/or clay, and are often important aquifers, the water being drawn from them being pre-filtered compared to the water in the stream. Geologically ancient floodplains are often represented in the landscape by stream terraces. These are old floodplains that remain relatively high above the present floodplain and indicate former courses of a stream. Sections of the Missouri River floodplain taken by the United States Geological Survey (USGS) show a great variety of material of varying coarseness, the stream bed being scoured at one place, and filled at another by currents and floods of varying swiftness, so that sometimes the deposits are of coarse gravel, sometimes of fine sand or of fine silt, and it is probable that any section of such an alluvial plain would show deposits of a similar character. The floodplain during its formation is marked by meandering or anastomotic streams, ox-bow lakes and bayous, marshes, or stagnant pools, and is occasionally completely covered with water. When the drainage system has ceased to act or is entirely diverted for any reason, the floodplain may become a level area of great fertility, similar in appearance to the floor of an old lake. The floodplain differs, however, because it is not altogether flat. It has a gentle slope down-stream, and often, for a distance, from the side towards the center. Floodplains can support particularly rich ecosystems, both in quantity and diversity. They are a category of riparian zones or systems. A floodplain can contain 100 or even 1,000 times as many species as a river. Wetting of the floodplain soil releases an immediate surge of nutrients: Those left over from the last flood, and those that result from the rapid decomposition of organic matter that has accumulated since then. Microscopic organisms thrive and larger species enter a rapid breeding cycle. Opportunistic feeders (particularly birds) move in to take advantage. The production of nutrients peaks and falls away quickly; however the surge of new growth endures for some time. This makes floodplains particularly valuable for agriculture. Markedly different species grow in floodplains than grow outside of floodplains. For instance, riparian trees (that grow in floodplains) tend to be very tolerant of root disturbance and tend to be very quick-growing, compared to non-riparian trees. In the United States, the National Flood Insurance Program (NFIP) regulates development in mapped floodplains based on the 100-year flood (1 percent annual chance of a flood of this magnitude). The Flood Insurance Rate Maps, typically depict both the 100-year floodplain and the 500-year floodplains. Where a detailed study of a waterway has been done, the 100-year floodplain will also include the floodway, the critical portion of the floodplain which includes the stream's channel and any adjacent areas that must be kept free of encroachments that might block flood flows or restrict storage of flood waters. When a floodway is shown on the Flood Insurance Rate Maps, the portion of the 100-year floodplain outside of the floodway is known as the flood fringe. Another commonly encountered term is the Special Flood Hazard Area, which is any area subject to inundation by the 100-year flood. A problem is that any alteration of the watershed upstream of the point in question can potentially affect the ability of the watershed to handle water, and thus potentially affects the levels of the periodic floods. 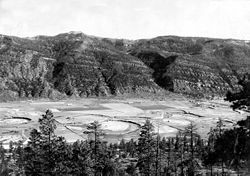 A large shopping center and parking lot, for example, may raise the levels of the 5-year, 100-year, and other floods, but the maps are rarely adjusted, and are frequently rendered obsolete by subsequent development. In order for flood-prone property to qualify for government-subsidized insurance, a local community must adopt an ordinance that protects the floodway and requires that new residential structures built in Special Flood Hazard Areas be elevated to at least the level of the 100-year flood. Commercial structures can be elevated or floodproofed to or above this level. In some areas without detailed study information, structures may be required to be elevated to at least two feet above the surrounding grade. Many State and local governments have, in addition, adopted floodplain construction regulations that are more restrictive than those mandated by the NFIP. The U.S. government also sponsors flood hazard mitigation efforts to reduce flood impacts. The Hazard Mitigation Grant Program (HMGP) is one funding source for mitigation projects. A number of whole towns such as English, Indiana, have been completely relocated to remove them from the floodplain. Other smaller-scale mitigation efforts include acquiring and demolishing flood-prone buildings or flood-proofing them. In some tropical floodplain areas, such as the Niger Inland Delta of Mali, annual flooding events are a natural part of the local ecology and rural economy. But in Bangladesh, which occupies the Ganges Delta, the advantages provided by the richness of the alluvial soil of floodplains are severely offset by frequent floods brought on by cyclones and annual monsoon rains, which cause severe economic disruption and loss of human life in this densely populated region. ↑ ECFR, Electronic Code of Federal Regulations, Title 44, Section 59.1—Definitions. Retrieved November 25, 2008. ↑ ECFR, Electronic Code of Federal Regulations, Title 44, Section 60.3 - Flood plain management criteria for flood-prone areas. Retrieved November 25, 2008. Anderson, M. G., D. E. Walling, and Paul D. Bates. 1996. Floodplain Processes. Chichester: Wiley. ISBN 0471966797. Bedient, Philip B., Wayne Charles Huber, and Baxter E. Vieux. 2008. Hydrology and Floodplain Analysis, 4th ed. Upper Saddle River, NJ: Prentice Hall. ISBN 978-0131745896. Bridge, J. S. 2003. 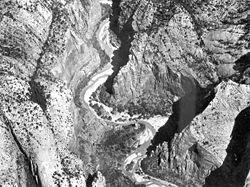 Rivers and Floodplains: Forms, Processes, and Sedimentary Record. Oxford, UK: Blackwell Pub. ISBN 0632064897. Marriott, Susan B., and Jan Alexander (eds.). 1999. Floodplains: Interdisciplinary Approaches. Geological Society Special Publication, no. 163. London: Geological Society. ISBN 1862390509. This page was last modified on 25 November 2008, at 14:46.